Those responsible for framing the resolution were very much aware that Israel’s hawks were going to proceed with their colonial venture come what may, in determined defiance of international law and no matter what the organised international community said or wanted. Put another way, some if not all of those responsible for framing 242 were resigned to the fact that, because of the history of the Jews and the Nazi holocaust, Israel was not and never would or could be a normal state. As a consequence, there was no point in seeking to oblige it to behave like a normal state - i.e. in accordance with international law and its obligations as a member of the UN. Like it or not, and whatever it might mean for the fate of mankind, the world was going to have to live with the fact that there were two sets of rules for the behaviour of nations – one for Israel and one for all other nations. Because of the way Israel was created, mainly by Zionist terrorism and ethnic cleansing and without legitimacy in international law, the UN system now had a double standard built into it, and because the political will to confront Zionism did not exist, there was nothing anybody could do to change that reality. As many no doubt know, the UN had a subcommittee studying the issue of whether it had the legal authority to partition Palestine. The committee concluded and reported to the UNSC that the UNSC did NOT have that authority under international law, but only the authority to implement the Palestinian Mandate of the League of Nations. However, the UNSC overruled that decision due to its fears over the consequences of not partitioning Palestine, given the hostility in the region and that the British were washing their hands of it. Therefore the UN subverted ITSELF in 1947 by allowing an illegal state - Israel - to come into existence by partitioning Palestine and allowing the Zionists to create Israel in 1948. The only solution to the Palestinian issue is for the UNSC and/or the General Assembly to REVERSE that decision, declare Israel an illegal, rogue state and re-assert international control of Palestine until a new Palestinian Constitution and Palestinian government can be created covering the whole of Palestinians and Israelis. Absent that action, the only resolution we shall see is either ethnic cleansing or genocide of the Palestinians by the Israelis at some point - or worse. Who drafted 242, and deleted 'the' before 'territories'? Was our Hugh Foot responsible? Is there a discrepancy between English and French versions, and how does it look in Arabic? @ Richard Steven Hack said... "As many no doubt know, the UN had a subcommittee studying the issue of whether it had the legal authority to partition Palestine. The committee concluded and reported to the UNSC that the UNSC did NOT have that authority under international law, but only the authority to implement the Palestinian Mandate of the League of Nations." Really? 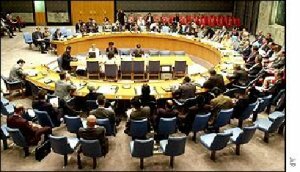 The UNSC refused to rubber-stamp the GA resolution 181 and passed other resolutions stopping the Zionists from changing the political arrangements. And appointed Count Bernadotte as the legal successor to the Mandate. I'm not sure the UNSC is at fault, except in so far as it has failed to put its wishes into action. Historically, the door to the illegal two-state concept proposed by the Balfour Declaration (1917) was closed in May 1948 when David Ben Gurion declared unilateral creation of Israel on the 55% of the historic Palestine. There is only one option to resolve the Zionist problem in the Middle East. That's a single Palestinian state with equal rights for both the Natives and the alien Jews - under a democratic secularist governance. There is now only one solution left to resolving this intractable problem, and one which would be taken up by any oppressed people: a military solution. The author is correct; everything Zionism has touched has become corrupted. Today the UN is meaningless. What is hardly known is that Israel recognized resolutions 181 and 194 as valid in the process of her admission to the United Nations. The Zionists even used the 194 to press the Soviet Union to allow their Jews' emigration to Israel. That's what I call chutzpah. The UN was clearly party to the problem in the first place. Perhaps became an instrument for promoting conflict rather than for peace: The UN as an instrument of Colonial Enterprise! Yes, I feel the British (under pressure from American Zionists in particular) did indeed wash their hands of Palestine. The Zionist hawks bumped off Bernadotte because he saw the solution as being under International not Zionist control. Given Israeli hawks desire to go a bombing when it suits them (or their masters) I don't think anyone believes in a so called two-state solution. I feel the only way forward is a democratic secular Palestine with equal rights for all. I would suggest a new ozgrniaation of Free Republics with Limited Powers (FRLP). It would have a bicameral legislature with the number of representitives in one house proportional to GDP, the other proportional to Population. The member state legislatures would elect representatives to the population body, and proxies would be gathered to vote for the GDP body. The FRLP would conduct audits of member governments, guarantee individual rights. Members governments would pay a fee to join, and a second fee to remain a member each year. Member states would gain trade and defense advantages.